Hosted by TPD. Sign up for an upcoming presentation. 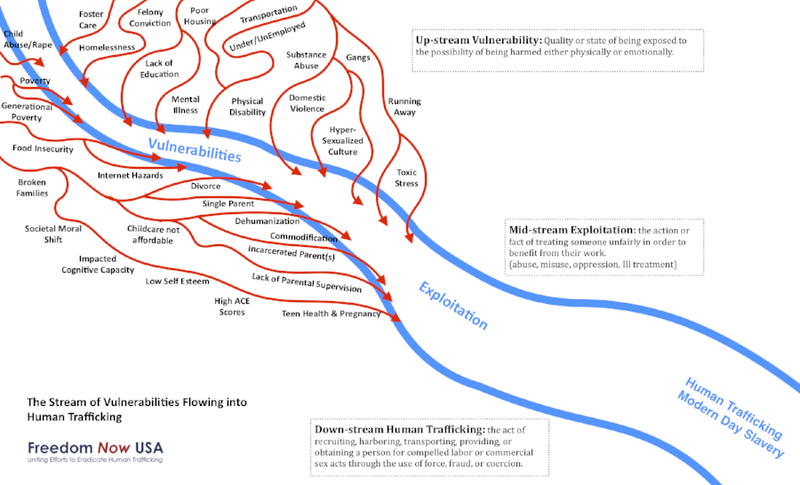 In an effort to understand how vulnerabilities in a community can lead to exploitation, which can lead to human trafficking, we created the River Graphic. This educational tool can be printed and used but not modified without permission. Human Trafficking, which is modern day slavery, is happening in communities across America in plain sight. Most people miss it because their eyes can't see what their mind does not know or comprehend. This tool lists helpful tips on recognizing human trafficking and how to report a suspicious situation. This tool is available for download and distribution but cannot be modified. If you would like this tool printed and shipped please contact us at info@freedomnowusa.org for a quote. When an individual first hears about human trafficking being present in their community, they experience a gamut of emotions from shock, denial, outrage, and confusion about how to engage. That's why Freedom Now USA offers the Next Steps tool, to assist individuals as they walk through a process of evaluating themselves and their community. This ensures efforts aren't duplicated in their community and that they choose a way to fight human trafficking that is a good fit for each individual's skill set, sphere of influence and passion - improving sustainability and success. This tool is available for download and distribution but cannot be modified. To eradicate human trafficking in the United States we must first become educated and then engage in the movement. It will take everyone working together to stop slavery in the United States. These tools offer a starting point to educate yourself and imagine how you can join the movement. This tool is available for download and distribution but cannot be modified.